Crazy as it seems, today is in fact the last day of January!! It's flown by for me, how about you? Nothing very exciting has been happening aside from starting my new job on Wednesday, I'm working evening shifts (3.15-9.15pm) in a care home which is a bit different from jobs I've had previously! I've got my third shift today and whilst I wouldn't say I'm loving it, it's good to be back working and it's certainly keeping me busy. I hope you've all had a lovely January! Here's hoping things start to warm up soon, I've had just about enough of not being able to feel my fingers. Without further ado, here are the products I've finished off in January. Lush Cupcake Fresh Face Mask This is possibly my favourite Lush mask ever! It smells like mint and chocolate and it's designed with oily, blemish-prone skin in mind; that's pretty much me. I reviewed it in full earlier in the month if you'd like to read my full thoughts, but suffice it to say that I really enjoyed using this. Sanctuary Spa Body Butter The scent of this body butter wasn't one of my favourites, although it did grow on me, but I did love the way this moisturised my skin, and it went a lot further than I was expecting too. I still have two more tubs the same size from the set I won in Ila's giveaway left to use up, so I'll have to see if they're as good and if I like either of their scents more! Repurchase? Probably not, as for the price I'd rather pay a couple more pounds to get a Body Shop body butter and love the scent! St Grape Aqua Bliss Bath Scrub This was a giveaway win shortly before Christmas and whilst I've enjoyed trying a product which has been so widely hyped by bloggers, I have to say I wasn't hugely impressed; the scent didn't do much for me, and this tub didn't last anywhere near as long as I'd want a product this expensive to last! I think I got six or seven uses out of it, meaning it came to almost £2 per use. Superdrug Tea Tree & Peppermint Facial Scrub I really enjoyed using this as the fresh, minty scent was right up my street and did a lovely job of exfoliating my skin, leaving me feeling soft and smooth. It's a really good price and has lasted well despite being quite a small tube, as a little goes quite a long way. Repurchase? Maybe, but not until I've used some of the other exfoliators and scrubs in my stash! Seche Vite Quick-Dry Top Coat This isn't technically empty, but as the brush doesn't reach the bottom of the bottle, there's not a lot I can do about it; what's left has gone gloopy and horrible, anyway. I did enjoy trialling this and it was handy not having to wait around for my nails to dry. I also really liked the super-glossy finish it gave, so I would consider buying again in the future; I'm just put off by the way it goes stringy and difficult to use halfway through the bottle. Palmers Cocoa Butter Formula Hand Cream This stuff smells AMAZING, which is why I have another couple of tubes in my stash; unfortunately, I bought them before I identified some of its ingredients as triggers for my eczema. I've still been using them as I hate wasting products, but only when my hands are in need of maintenance rather than when I have active patches of eczema. I'll use what I have like this, but won't be buying again because of the petrolatum content. Bodycare Cotton Pads There's nothing special about these, I literally just picked them up because I saw them and remembered I was nearly out. The pads were quite thin and prone to falling apart so I wouldn't go out of my way to get these particular ones again. 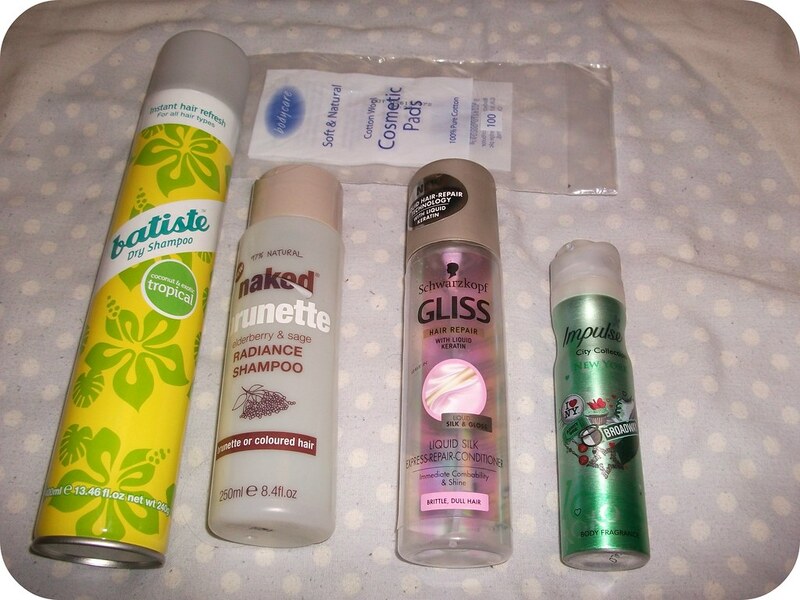 Batiste Tropical Dry Shampoo This features in my Empties posts pretty much every month as I use it almost daily and couldn't be without it! There's not much more to say, really. I always have a spare can in my stash! Naked Brunette Radiance Shampoo* I've really enjoyed trialling the Brunette Radiance duo although, as per usual, I've run out of shampoo and still have half a bottle of conditioner left! This has left my hair clean and soft, although I'm still not sure it did anything to enhance my hair colour - regardless, it did leave my hair looking healthy and shiny, so I can't complain. My only complaint is that my hair did seem to get oily more quickly than when using my regular Volume shampoo. Repurchase? Yes, although I'd alternate it with the Volume shampoo in future. Schwarzkopf Gliss Liquid Keratin Spray I've had this quite some time and have just started using it again to try and finish it up in the last couple of months; I actually really enjoyed using this and am not sure why it got pushed to the back in terms of haircare products! It makes a perfect de-tangling spray, leaves my hair feeling soft and silky, and smells really good, too. I just wish it acted as a heat protectant as well! Repurchase? Maybe, although I do have other similar products to use up first. My Featured Blogger this month is the lovely Anna from AnnieMAC; hop on over to her blog for tutorials, reviews and more! I'm not sure I would buy Seche Vite again, it's expensive and you can't reach the bottom. Mine went really gloopy before I even had the chance to get down past the brush...not too happy about that. It was a fantastic top coat but I'm looking else where for a new one now. Good luck in your new job, I'm sure as you continue to go you will enjoy it more. It's always a bit weird starting somewhere new. Do you recommend dry shampoos for those with oily scalp? I can't really use the Palmers too much as it triggers my eczema but I adore the smell! 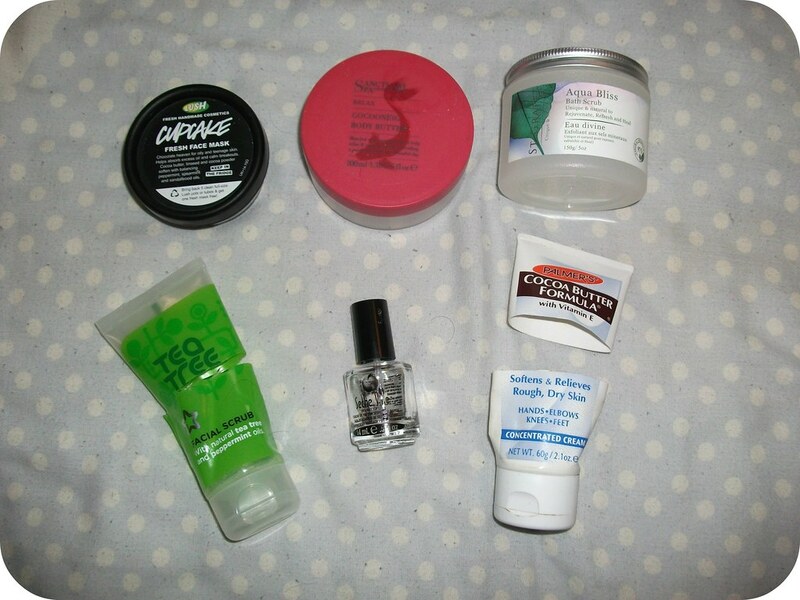 You finished quite a lot, I really wanna try that naked brunette shampoo and the lush mask! I love empties posts as they end up being mini reviews for everything. I usually have a tube of Palmer's kicking around, I like it. I didn't care for Seche Vite. I love seeing the things that you've used up. New follower here, so you'll see me around. Thanks for sharing. I definitely want to try the cupcake face mask at some point! 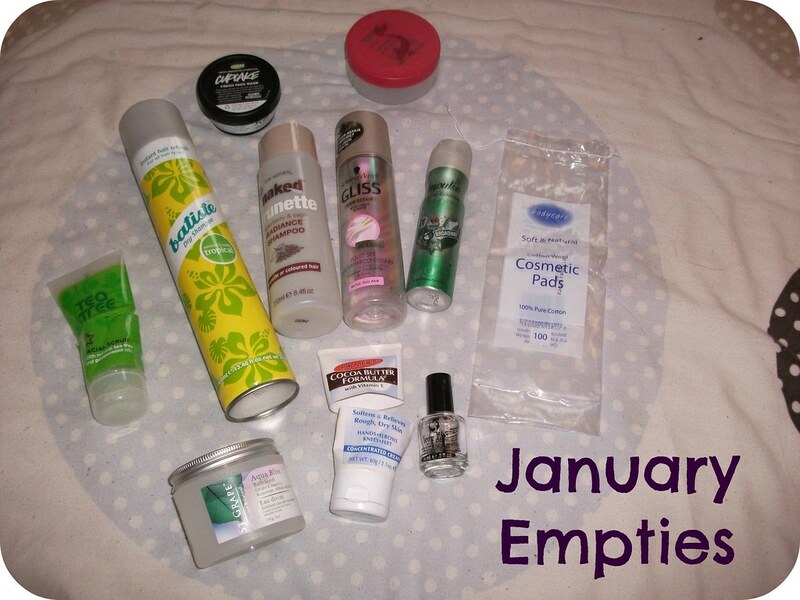 Lovely empties, you've managed to get through so many things - I need to get better at using things up!